Pages: xii + 366 pp. By the very nature of the beast, anthologies are a mixed bag. No matter what the subject an anthology may be treating, there are bound to be some contributions that are better than others; or, some pieces that are several grades below the quality of the remainder. When the anthology concerned originates in the proceedings of a conference, this situation can often be exacerbated considerably. And, when an anthology is composed of pieces both by scholars and by “practitioners” of various sorts who may have insight into the subjects considered but who do not have an academic background, the resulting bag can be even more mixed and slanted toward some pieces appearing better or worse than others. 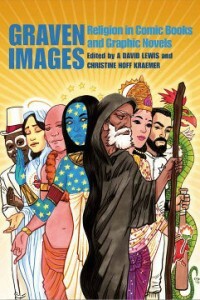 This new anthology on the religious content, imagery, and uses of comics and graphic novels, however, breaks that trend in anthologies entirely — in the mind of the present reviewer, there was not a single weak piece in this collection, and all were enjoyable and insightful, and well worth reading. For that reason alone, I give the editors the highest kudos and congratulations on producing an excellent volume. But, beyond that extremely high standard and wonderful accomplishment, there is a great deal to like about this volume. Anyone who enjoyed Christopher Knowles’ Our Gods Wear Spandex: The Secret History of Comic Book Heroes will enjoy this volume even more. From my own readings and research into the universe of comics (particularly those produced in the last thirty to forty years), some of the most innovative and interesting fully-fledged mythologies are emerging in comics rather than in fiction, poetry, television, or film, and it is wonderful that there is a growing amount of attention being given to this phenomenon amongst academics, particularly at such well-regarded institutions with respected religious studies programs as that of Boston University, where the conference that resulted in this volume’s compilation took place. The twenty-one chapters (plus a foreword, the editors’ introduction, and three short appendices) discuss religion and comics generally, but the majority of pieces discuss themes particularly having to do with Christianity in some way; there is one piece specifically dedicated to Mormonism, and a few also touch on one of the most ingenious, infamous, and widely successful usages of comics in a Christian context: the phenomenon of Jack Chick tracts. The second section of the book, “Response and Rebellion,” mostly has to do with Christian themes, though this is also where Kerr Houston’s insightful and enjoyable discussion of Persepolis is found, dealing with certain aspects of Islam and the Iranian Revolution, particularly as reflected in the book’s artistic styles. There are also a few pieces which touch on Judaism in the first section; but there are also pieces that have as their main religious framework Hinduism, Japanese traditional religion (“Shinto,” while accurate, is not used because the work detailed is that of Hayao Miyazaki, and he prefers not to think of his animism in what he sees as institutional religious terms), and magic and paganism in the first and third sections. As these pieces in particular would probably be of most interest to the readers of Eternal Haunted Summer, it seems logical to focus mostly on them — though I would highly recommend that everyone who gets their hands on this book read the entirety, as there are many enlightening historical and theological insights given along the way in relation to these various non-polytheistic religions. The works of Alan Moore, Grant Morrison, and Neil Gaiman feature prominently in the final section of the book, “Postmodern Religiosity.” The uses of linguistic magic are the focus of Megan Goodwin’s analysis of Grant Morrison’s Invisibles series, while the possibilities of a mystagogic or psychogogic use for comics is to the fore in Christine Hoff Kraemer and J. Lawton Winslade’s piece on Alan Moore’s Promethea. Emily Ronald’s piece on Neil Gaiman’s Sandman deals with the frequent presence of deities in Gaiman’s epic graphic novel, but also the theme (present elsewhere in Gaiman’s works) of the issue of belief or its lack in mortals in the series. Moore also receives attention in the essay from first section (“New Interpretations”), dealing with his “Ripperology” From Hell in Emily Taylor Merriman’s “London (and the Mind) as Sacred-Desecrated Place in Alan Moore’s From Hell.” Moore and Morrison also share the stage in an essay from the first section, Saurav Mohapatra’s “Echoes of Eternity: Hindu Reincarnation Motifs in Superhero Comic Books,” where he deals primarily with Moore’s Supreme and Morrison’s Animal Manin a most intriguing fashion. Mohapatra is one of the several comics writers whose contributions to the volume enhance its appeal greatly. Perhaps one of the most interesting pieces in the final section, however, is by the writer of the comic Artesia, Mark Smylie, who discusses the specific influences of scholars like Marija Gimbutas, Joseph Campbell, J. G. Frazer, Margaret Murray, and Martin Bernal on the polytheistic theology present in his work. The lack of favor toward these scholars shown by many academics in recent decades is clarified by Smylie in the following manner: “as a fiction writer I was free to find the ideas in their works that resonate with the world I wanted to create … Of course the real world is more complicated than that … I can, as a fantasy writer, make ‘true’ a theory, grant a wish or three, make the world how I want it to be rather than how it is” (p. 300). This precise interpretive discernment would be a great boon, indeed, if applied by more modern pagan practitioners to their enjoyment of some of these works. The true value and appeal of these theorists’ work does not lie in their factual reflections of the ancient world, which is all too often assumed by many pagan consumers of their work, but instead its value lies in the meaning and color which they can give interpretively to the material. This is just as true of any actual mythology and its applicability to lived human existence as it is for the comics and other narratives we enjoy. One doesn’t have to have scientific validity and fact in one’s science fiction, nor in one’s religious myths. Smylie’s keen insight here is valuable, and his playing out of what he has found in his research makes me want to get a hold of Artesia very much indeed. One of the essays that most highlighted the difficulty of translation, not only between languages and cultures, but between comics and animated film, and between religious cultures, is Eriko Ogihara-Schuck’s “The Christianizing of Animism in Manga and Anime: American Translations of Hayao Miyazaki’s Nausicaä of the Valley of the Wind.” The ways in which animism and a rather dualistic Christianity are played off one another in the manga, but also the ways in which the American translation of the film version of Miyazaki’s story lent itself to Christian interpretations perhaps not intended by its creator, is a very fascinating study in the dynamics of these varying religious viewpoints. Ultimately, the all-embracing animism of the one does not negate the possibilities of the Christian interpretation (either religiously or inter-religiously), but instead includes them. This is quite an excellent insight, and raises similar questions for all of the American film translations of Miyazaki’s films, particularly those that are the most polytheist/animist-friendly. As mentioned at the outset, this is a rich and wonderful collection, and I hope that many of the authors who contributed to it will be following up with further studies of the works and authors already examined, as well as several others. If one is interested in graphic novels and comics, and finds the possibilities within the extant corpus religiously significant, or if one is an aspiring comics artist, writer, or scholar oneself and hopes to deal with religious themes, this book will be an indispensible resource for many years to come.